Tired of cliché career advice? 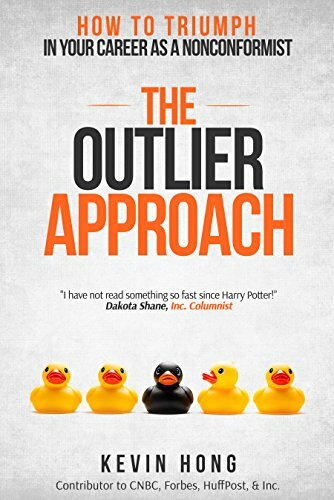 Learn The Outlier Approach! Too many books discuss the same people, same companies, and same concepts, resulting in cliché advice. One of the main reasons behind this phenomenon is due to the fact that so many books on business and professional development are written by authors with limited professional experience or are written by authors who share similar backgrounds. Furthermore, too many successful professionals lack writing experience, resulting in books that may have great content but poor narration. Kevin Hong, who is a columnist for Inc. Magazine, not only shares his experience working in Hollywood, Silicon Valley, and Wall Street, but also interviews and shares his experience working with high profile executives and entrepreneurs who have built their companies to nine or ten figures as well as Hollywood celebrities, YouTube celebrities, a former NBA star, and even a politician to share the most unorthodox ways of winning in one’s career and business. Some of his highlights include working on a start-up lesson video which included Justin Kan, who sold his company Twitch for $1 billion, and other Silicon Valley elites as well as advising on film distribution for the film ‘The 60 Yard-Line, which featured notable celebrities such as Randall Park and Chuck Liddell. He also managed to squeeze in an interview with Psy’s adviser from Korea who helped Psy bridge a partnership with Scooter Braun, Justin Bieber’s manager, to help make Gangnam Style into the viral video it became. Hong, who is now a C-Level executive of a subsidiary of a publicly traded company, built his last start-up up to a $15 million valuation, and has shared his business advice by contributing articles for CNBC, Forbes, Huffington Post, Inc., Film Journal, Korea’s Maeil news and various media outlets. The book, which is written in a unique style, does not try to “teach” you another lesson. The goal of the book is to illustrate “The Outlier Approach” by bringing in the reader into the experience opposed to explaining business concepts in a long drawn out lecture style. The book has an emphasis on character development and conflict in order to explain the “why” and “how” when certain strategies need to be applied in one’s career. Ultimately, if you are not interested in walking a straight line or following text book directions to succeed in your career, this book is for you. This book is for the oddballs, misfits, outliers, rebels, and nonconformists in all of us.